After Bangladesh we had a night near the Bangkok airport, and then headed on to Cambodia. The Poipet border crossing sounded pretty intense from our guide book and various websites, with fake visa offices and swindlers galore, but we had no problems. The bus we took from the airport transit center brought us to within two blocks of the border, we went through Thai immigration, got our Cambodian visas (we had brought passport photos and declined to pay extra to the immigration officer standing around) and were through in about an hour. We had met an American couple waiting in line and walked with them past the free bus to the expensive transit center out of town and hired a cab to take us to Siem Reap for cheaper than the tourist bus would have been. We were pretty tired, so we stayed near our hotel for dinner and made a Cambodian family very happy by coming into their restaurant. 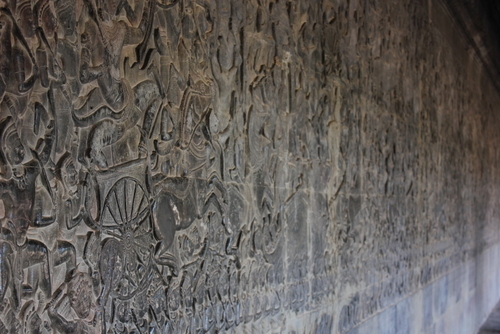 The next day we hired a tuk-tuk to take us around some of the Angkor temples. Most people know the area as Angkor Wat, but really Angkor Wat is just one of many temples in close proximity built during the Angkor period. 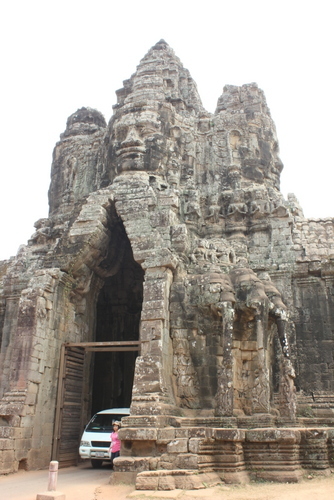 Entrance to the temples comes in the form of 1, 3, and 7 day passes, and we opted for 3 days. (We probably could have done it in 2 if we busted our butts and didn’t bike, but 1 day would definitely not be enough). 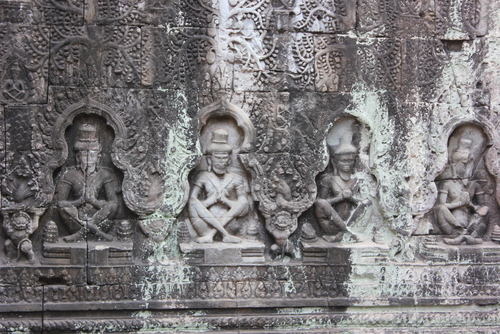 We started with the Grand Circuit, checking out Preah Khan, a temple fusing Buddhist and Hindu worship. 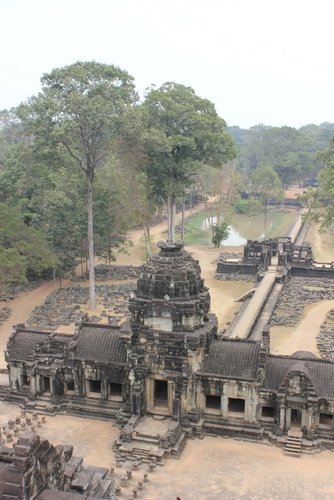 Next was Neak Pean (there does not seem to be standardize spelling for some of the monuments’ names), a water temple that looked pretty cool, but you couldn’t get close enough to see much. 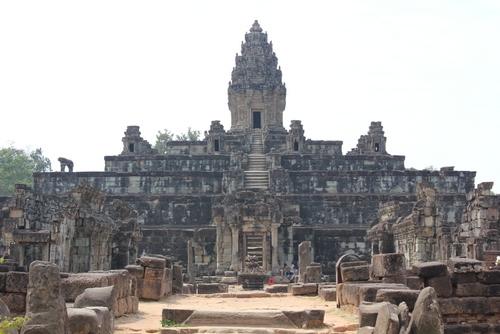 Next we visited Ta Sohm, with its smiling faces above the gates, West Mebon with its elephants gazing out from the corners, and then Pre Rup, towering above the landscape. Then it was time for lunch. After lunch we headed out to the Roluos group, an older set of temples set away from the others, where we visited Bakong and Prea Ko. Exhausted from our day climbing temples in the heat, we headed back to the swimming pool at our hotel and then into town for the evening. The next day we rented bikes and headed back for more temples, this time hitting up the lesser circuit. 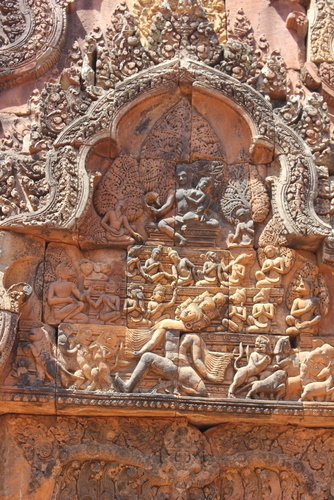 We started at the old monastery of Banteay Kdei with its bas-relief carvings of heavenly maidens, and then took a gaze at Sra Srang, the lake-sized bathing pool. 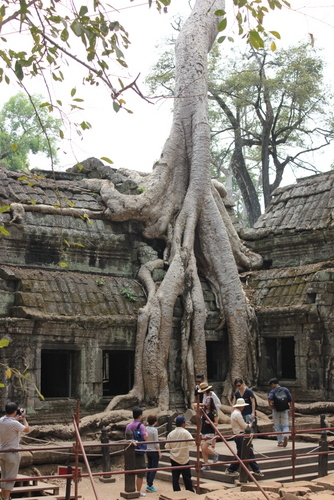 Next, we visited Ta Prohm, also known as the Tomb Raider temple because of the extent to which the jungle has reclaimed it with towering trees. 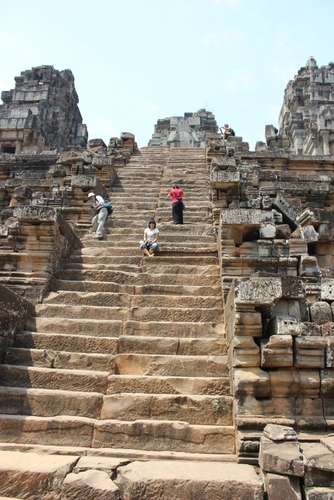 Then we climbed the very steep steps of Ta Keo. 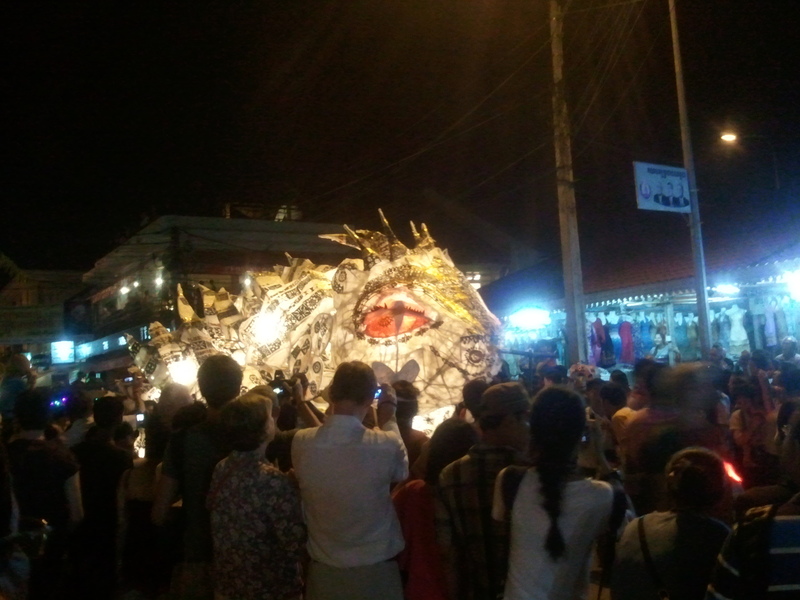 One of the really interesting things was the extent to which the crowds varied by site. 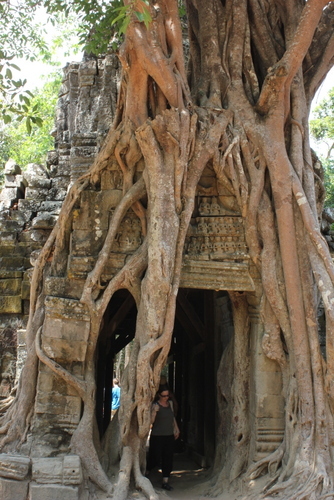 Ta Keo was nearly deserted (probably because of its steepness), where Ta Prohm has been packed. 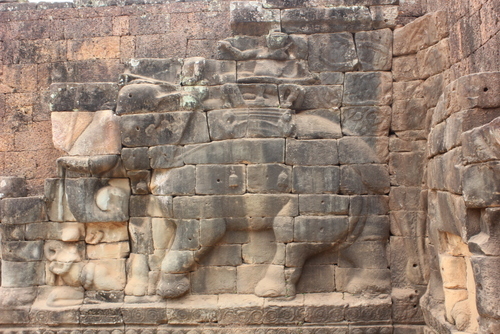 Next we rode into the Angkor Thom complex and had lunch. 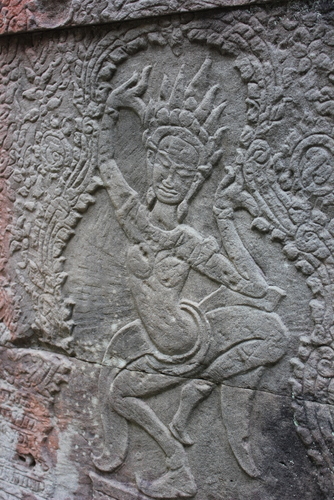 A heavenly maiden at Banteay Kdey. I don’t think I’ve ever seen a carving like that at a monastery before. 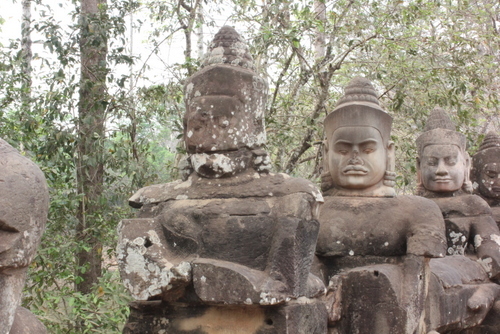 After lunch we visited the Terrace of the Lepper King (likely actually dedicated to the god of death), Phimeakas, Baphuon, and the Terrace of elephants. 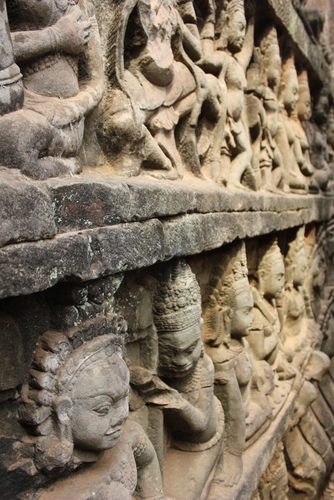 All were incredible in their own ways with wall carvings, a wall designed to look like a reclining Buddha, a causeway, and carved elephant supports. 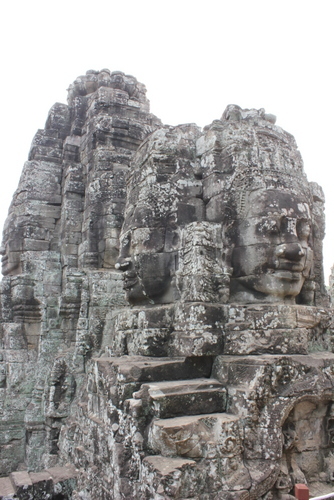 Finally, we stopped into Bayon, our favorite of all the sites at Angkor. 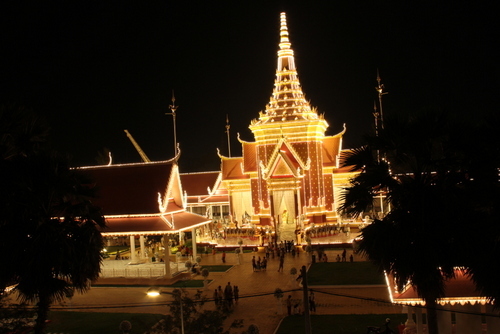 Built as a state temple, each of the towers features four smiling faces that make the area quite stunning. We rode out through the gate and across the bridge with its hulking stone figures back to town. 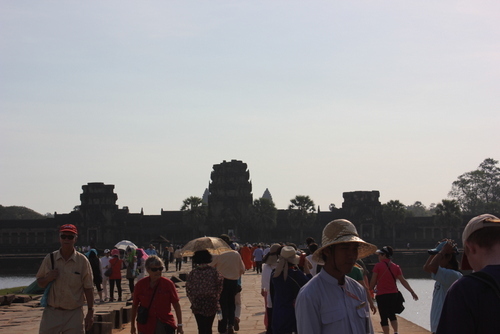 The next day we headed back for the main event, Angkor Wat. 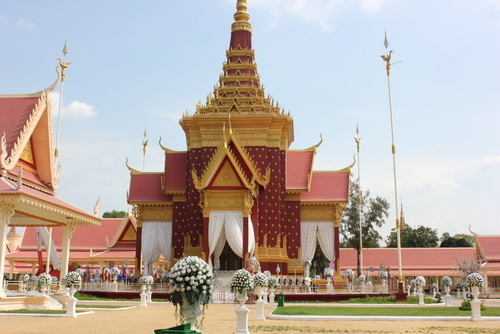 Considered the largest religious complex in the world (not sure what that means exactly), this grand temple includes incredible quality in addition to its quality. The stupa towers seemed more beautiful to me than those of the other temples and the walls were covered with bas-relief epic tales. 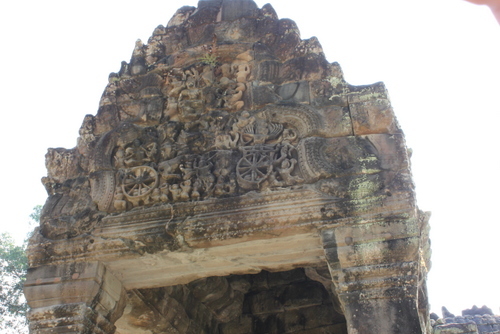 Next we took the long tuk-tuk ride out to Banteay Srey, the citadel of ladies, so called because of the delicacy of the carvings. Though it took an hour by tuk-tuk, the site did not disappoint. 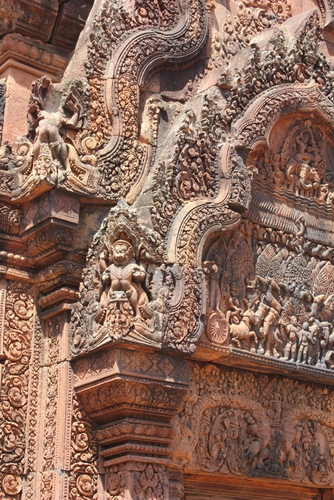 The carvings were quite fantastic and detailed. 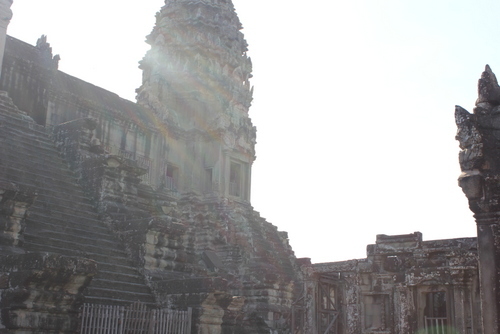 The Angkor temples were truly amazing; they were probably my favorite such site I’ve ever been to. Throughout our three days, it seemed like each temple was better than the last.Templed-out for the time being after Banteay Srey, we had a relaxed afternoon. 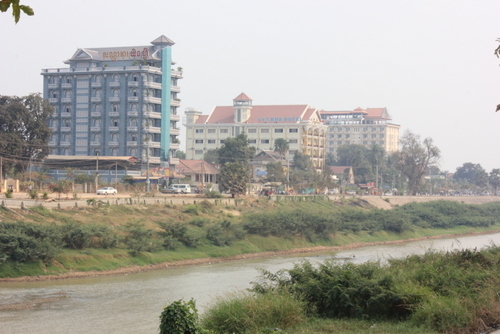 The next day we headed by bus to Battambang, Cambodia’s second largest city, but pretty small with only 140,000 people. We spent two relaxed days here, getting our visas for Vietnam with minimal hassle (the whole process took 30 minutes, compared to a day in Phnom Penh, 3 in Bangkok and who knows how long elsewhere). Bowen took a cooking class, and we enjoyed wandering the streets of a non-touristy town. And ate great food, including the best spring rolls either of us has ever had. 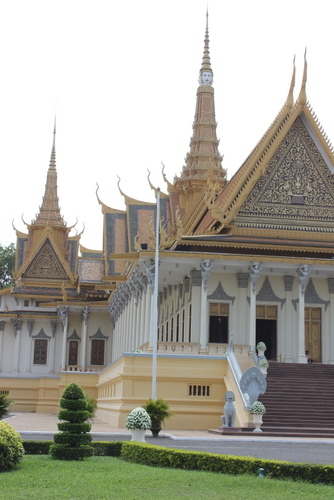 We finished our time in Cambodia in Phnom Penh, the capital. Our hotel was right across the street from a site that we discovered had been built for the old king’s memorial and began to be torn down the day after we arrived. Our first day we took it pretty easy, wandering around to the main market, which was very cool, and checking out a mall. 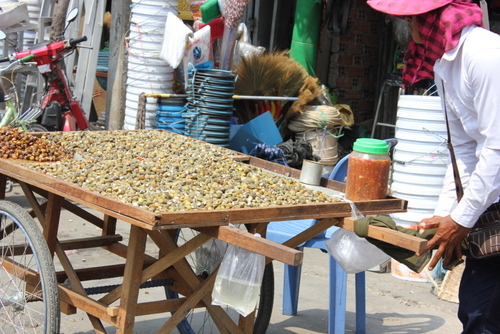 These clams, which I like to refer to as “the shits in a shell” sit out in the sun all day and are sold all over Cambodia. We did not try them. 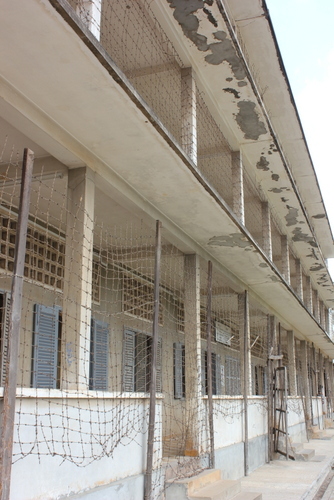 The next day we walked over to Tuol Sleng Prison. 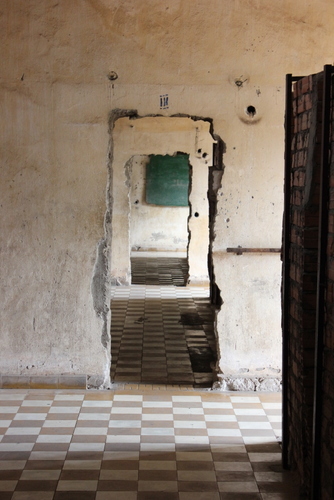 Now a museum, it had originally been a high school and then when the Khmer Rouge closed schools, it became a prison where Cambodians were tortured until they confessed to bogus crimes before being executed. 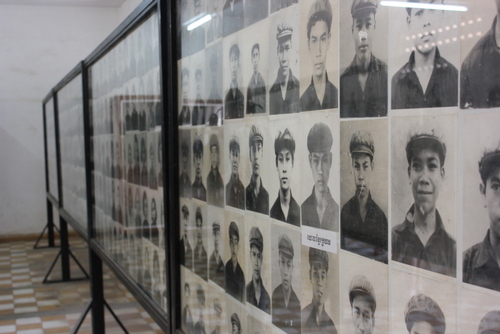 The site has a very intense feel to it, enhanced by photographs of all the victims, as well as a few grainy ones taken of the corpses found when the site was liberated (with only 7 remaining inmates). After the prison museum we visited the Royal Palace. 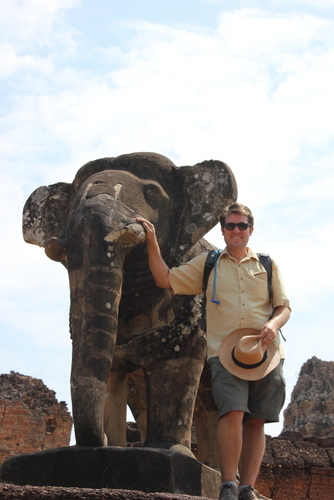 Unfortunately much of it was under construction or off limits, but we did see some lovely temples, the throne room, and the king’s elephant mount. 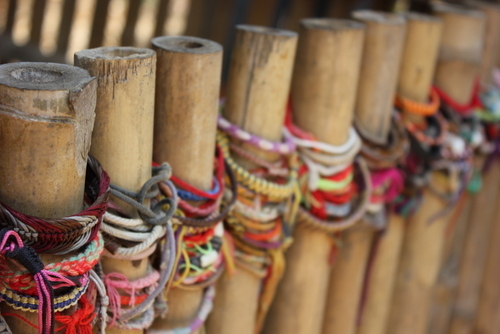 The next day we got a tuk-tuk out to Choeng Ek, better known as the Killing Fields. 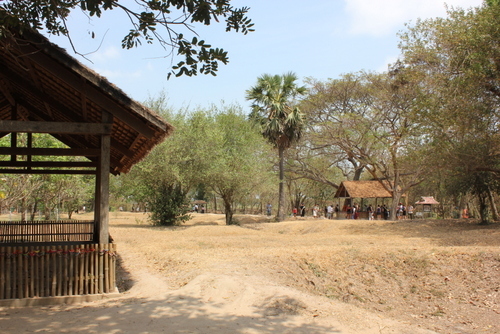 This is the site where the Khmer Rouge executed “enemies of the state”, mainly ordinary folks who had done nothing worse than get on someone else’s bad side, and then buried then in shallow graves. Bones and bits of clothing still come to the surface during the rainy season. 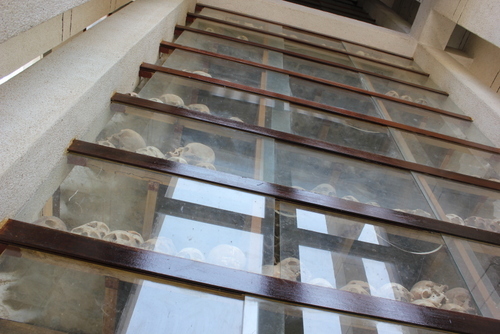 It was a very peaceful site, and hard to reconcile with the horrors that had occurred there. The excellent audio guide explained many of the areas and gave the history of the site, but the memorial stupa, with level upon level of skulls, really showed the immensity of this particular element of the Khmer Rouges crimes (but doesn’t tell of the many other horrible things this group did). 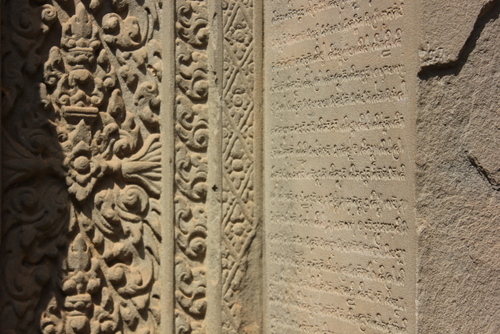 The next day we visited the National Museum and saw more of the excellent stonework and other art of the premodern Cambodians. Then we took a break and spent the afternoon sitting in a cafe. 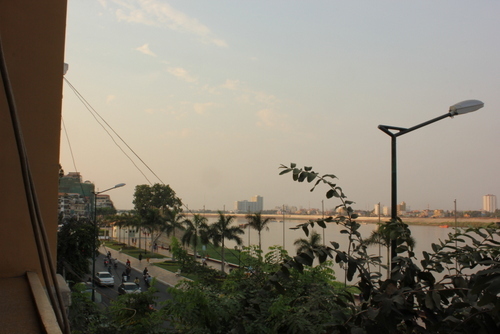 Phnom Penh is a lovely city, fun and relaxed with a vibrant feeling in the streets and along the river, and nice cafes. In the evening we treated ourselves to a happy hour cocktail at the Foreign Correspondents’ Club along the river before heading to the night market for a cheap and delicious dinner. 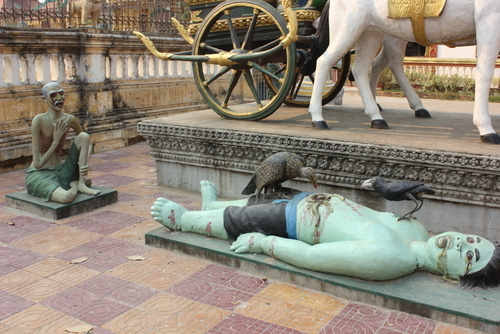 Cambodia was wonderful. 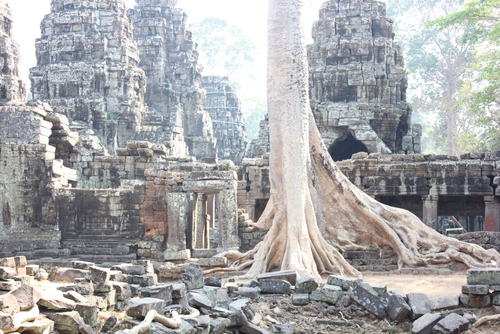 It offers one of the world’s greatest tourist attractions in the Angkor Temples, but also good (if not very varied) food, low prices, friendly people, and a nice and manageable capital city. The more recent history is truly heartbreaking, but also provides important sites to visit to help remind us of what can happen when governments care more about abstract ideas than about their own people.